It's the principal products covering more than 100 kinds of products in 7 series and can meet different needs of customers. For special demands of customers, we offer particular solutions. All the products are not only able to low customers cost and security risk effectively, but also solve the problem of which the waste oil contaminates environment. Main products: Vacuum oil purifier, transformer oil purification, transformer oil purifier, transformer oil regeneration, lube oil filtration systems, turbine oil reclamation systems, oil treatment, Turbine Oil Reclamation Systems, Lube Oil Purifier, Hydraulic Oil Filtration Machine, Compressor Oil Recycling Plant, insulation oil purifier, transformer oil purification systems, Waste oil recycling, lubricants recycling, dielectric oil filter machine, palm sludge filter, Oil flushing equipment, Quench oil filtering system, portable oil tester, oil/water separator machine, Oil thermal vacuum purification system, turbine oil purifier, engine oil purifier, Oil degassing system, Transformer oil reclamation system, hydraulic oil recycling machine, Vacuum oil filling system, compressor oil purifier, coolant oil purifier, Motor oil reclamation system, vegetable oil purifier, cooking oil refining equipment, gasoline absorption oil purification, oil Dehydration, oil disposal, oil filtering, oil preprocessing, oil filtration, oil reclaim, oil reconstituted, oil restoration, oil resuming, oil Separation, oil recuperation, waste management, oil reconditioned, Vacuum Dehydrators, Oil analysis equipment, By- Pass oil filters, electrical service, transformer maintenance, etc. If you are interested in our oil purifier machines for recycling used oils, please don't hesitate to conct us. Power Generation Plants: Utilizes a large quantity Turbine Oils, Gear Oils & Hydraulic Oils. Contaminate free oil is very important in protecting very expensive components. 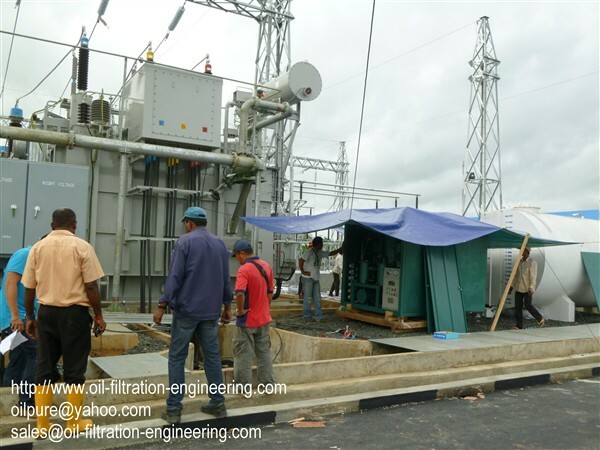 Power Distribution: Utilizes a large quantity of Transformer Oils. The transformer is the life line of the Power Utility Market and is typically treated with a great deal of respect. Replacement oil is typically quite expensive and proper maintenance can ensure that transformer life is extended. Oil Purification Service Companies: Service companies from an integral part of any company's daily operation, as many companies subcontract the cleaning of their oils and wastes to several service companies.